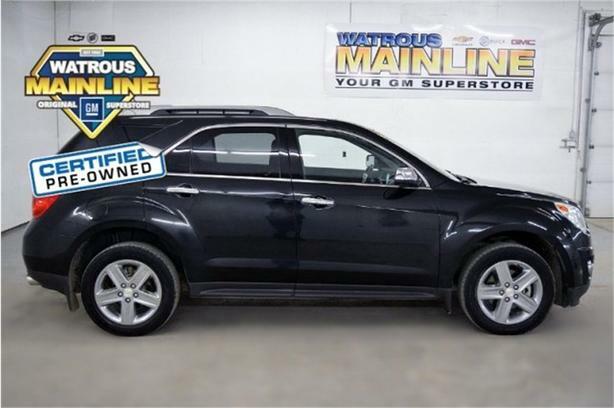 Check out this One Owner certified 2014 Chevrolet Equinox LTZ. Its Automatic transmission and Gas/Ethanol V6 3.6L/217 engine will keep you going. This Chevrolet Equinox features the following options: 18 X 7 chrome clad aluminum wheels, 6-speed automatic transmissionpower tilt-sliding glass sunroof including express open, wind deflector, ENGINE, 3.6L DOHC, V6 VVT DIRECT INJECTION (DI) FLEX FUEL (E85 CAPABLE) including polished stainless steel dual tip exhaust, 155 amp generator, 660 CCA battery w/rundown protection, hydraulic power steering, 3500 lbs/1588 kgs towing capacity, 79L fuel tank, 2400 kg (5291 lbs) GVWR. Test drive this vehicle at Watrous Mainline Motor Products Ltd, 208 1st Avenue East Box 70, Watrous, SK S0K 4T0.